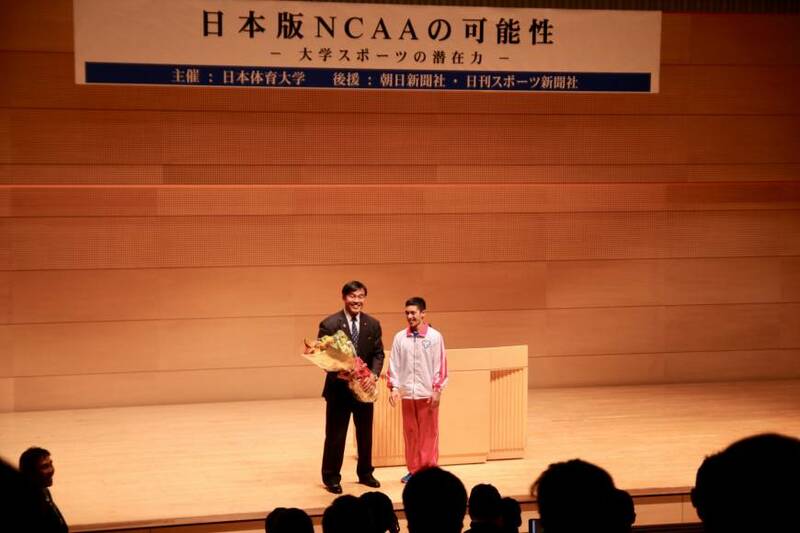 Former education minister and pro wrestler Hiroshi Hase (left) stands with gymnast Kenzo Shirai during a symposium on the creation of a Japanese version of the NCAA on Saturday at Nippon Sport Science University. and the benefits to be had by its presence. Among the variety of topics under discussion, some insist safety management is a pressing issue they need to get a handle on. Hiroshi Hase, a lawmaker and former education minister, urged those involved in the reformation of Japan’s collegiate athletics landscape and the foundation of the Japanese NCAA to look at what changes need to be made immediately. Hase said during his keynote speech at a symposium on the Japanese NCAA at Nippon Sport Science University (NSSU) in Tokyo on Saturday that the safety issue is a pressing problem that has to be resolved quickly. Hase cited as a recent example, the plight of a Greco-Roman wrestler from a Tokyo university, who damaged his cervical spine during a training camp at the National Training Center. Reportedly, the wrestler suffered an injury while sparring in mid-September and was paralyzed (although the incident did not come to light until news outlets reported it last month). Also Japan allegedly has not yet set up a compensation system to financially support athletes. Hase went on to say he had gotten confirmation from the Japan Sport Agency on the issue of the national federations’ insurance policies. “They said that the budgets are distributed to the federations, but that it is up to the federations whether or not they take out insurance (on their athletes),” said the 56-year-old, who competed in the 90-kg class in the Greco-Roman wrestling competition at the 1984 Los Angeles Olympics and later became a pro wrestler. Hase, who was education minister when the Japanese NCAA talks began in earnest in 2016, touched upon another “negative story” about Japanese collegiate athletics. He said a head coach and his staff at an unspecified university sports team forcibly collected ¥100,000 per year from their athletes’ own pockets and used the funds for recruiting and paying prospects ¥50,000 as a “nutrition fee” at their own discretion. Hase added that the head coach was earning a surprisingly large salary. The Japan Sports Agency found out about the practice and those staffers ended up being fired, the Liberal Democratic Party lawmaker added. Hase, however, showed confidence that the Japanese NCAA, by having legitimate athletic departments at universities, would bring proper governance and trust to the collegiate sporting scene. While several universities will have athletic departments at the outset, Hase said it would be ideal for all the country’s universities to eventually be overseen by the Japanese NCAA. For the symposium, several collegiate scholars from different institutes assembled to introduce their own research areas in regards to the Japanese NCAA and the reformation of collegiate athletics. In September, the JSA designated eight universities, including NSSU, the University of Tsukuba, Waseda University and Ritsumeikan University, to lead the push to promote collegiate athletics. Hiroshi Yamamoto, a two-time Olympic archery medalist who is the head of NSSU’s athletic department, said Japanese collegiate athletics are “obsolete,” as nobody has overseen the sports and teams. He advocated for NSSU to form an athletic department in 1997 and has supported its top-level athletes, but thinks it’s time for the institute to cooperate with the athletic departments of other schools.